DP World is a leading enabler of global trade and an integral part of the supply chain. We operate multiple yet related businesses – from marine and inland terminals, maritime services, logistics and ancillary services to technology-driven trade solutions. We have a portfolio of 78 operating marine and inland terminals supported by over 50 related businesses in over 40 countries across six continents with a significant presence in both high-growth and mature markets. We aim to be essential to the bright future of global trade, ensuring everything we do has a long-lasting positive impact on economies and society. 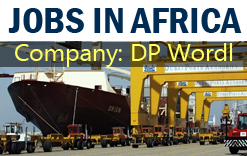 Required candidates for DP World port construction projects at Africa. SKYWARD CONSULTANCY is a government recognized Overseas Manpower Management Agency. We provide world class service & hiring solutions to our clients, as a leading overseas placement agency, Reg. No B-0997MUM/PART/1000+/5/7129/2005 that is built on genuine long-term partnerships through the application of solid industry experience, superior business practice, and commitment. We pride ourselves in working with some of the top companies based in the Middle East. Required Experience: Minimum 5 years in relevant field. Interested candidates can apply with updated Resume and relevant documents.